With markets like VoIP and streaming video/audio rising on the Internet, and with the successful concept of video calling/MMS’ing on the go — all made possible through growing broadband penetration — new Seattle-based startup EyeJot takes the two the two concepts and puts them together to form ‘video messaging,’ or the idea of sending webcam-recorded video like e-mail. There have been ideas as such before, but Eyejot really goes a step further and makes the process all web-based. To get started, you sign up for free and get a EyeJot username which you can send messages off of and other people can send to you. After doing so, you’re taking to your inbox which resembles exactly an e-mail one except for the fact that the ‘message body’ area consists of a video rather than a large text area. Also like traditional e-mail, there are three folders (‘Inbox, Sent, Deleted’). Get your peers and family to sign up, and you have a video community thing going. 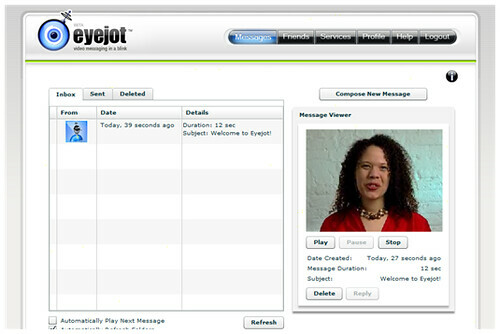 Sending an Eyejot requires a webcam installed, and since EyeJot is all Flash-based it offers seemless recognition and of webcams. Like an e-mail, record your message, add information to the ‘To’ and ‘Subject’ area, and send. The message should now land in the other users’ mailbox, and they can then choose to reply to it or forward it. Of course, this is a web-based service and it’s Web 2.0, so your address book is more of a social network and it also allows you to create groups. Additionally, people aren’t the only things you can send your video messages to: a site widget is offered to put up your messages on a website (great for video bloggers? ), an RSS feed for subscribing to through iTunes et al as a video podcast, and a URL to view your messages on a cellphone. To be honest, EyeJot shows promise. The concept is excellent and the service is really easy to use, but I’m wondering why they chose such a name and with the concept that they have, if they could’ve put a better spin to it. Perhaps a name like ‘Vmail’ or ‘VideoMail’ and super-emphasis on the idea that this is video for e-mail would’ve been better suited — people would get it immediately rather than connecting in their minds the meaning of ‘eye’ and ‘jot.’ On other aspects, the execution is not too bad at all, and I think if they can get around the problem of getting whole communities into it rather than individuals who’ll then walk away since they won’t have anyone to send their video messages to, it could take off.